Peace and tranquility reign. Unwind and channel your inner energies. 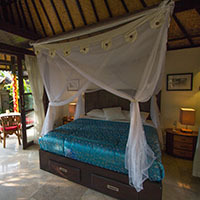 Rejuvenate yourself in our intimate sanctuary, where nature and your soul blend into one. With the coconut breeze and rice views, you are in the essence of paradise. Your home away from home. 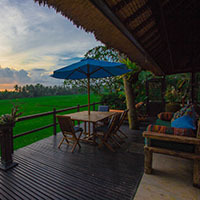 Nestled at the edge of sprawling rice fields minutes from the heart of Ubud, Lodtunduh Sari boasts a private gardened compound on which sits a handful of discreet traditional bungalow style accommodation with alang-alang roof. Crafted by a local architect, this postcard-ready retreat was designed with a yearning for peace and tranquility, a sanctuary leagues away from the real world. 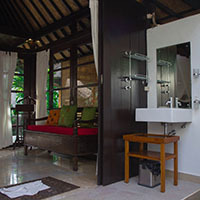 The property features two fully-furnished villas overlooking rice fields and four small cottages each with private terrace, garden, pond and luxurious open-air bathroom. At the center of the retreat lies a serene yin-yang saltwater swimming pool perched on the edge of the rice fields so you may enjoy tireless views of the vast expanse of verdure, mountains and irresistible sunsets. 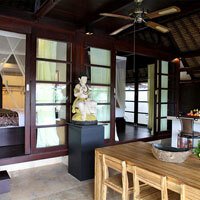 The property is fully staffed with charming Balinese to cater to your every whim. A knowledgeable English-speaking driver is at your disposal with car for hire. In-house massage is also available. 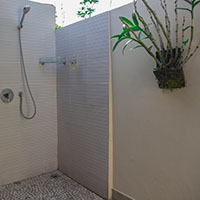 Escape the hustle and bustle of beaches in Kuta and Seminyak for the privacy, peace and inspiration of the hills as encapsulated by Lodtunduh Sari Checkout details of our accommodations or reserve now.